The details regarding the RRB Traffic Apprentice Admit Card 2019 are out. Officials of the Railway Recruitment Board announced the details regarding the admit card and the exam date. Aspirants who applied for the post of Traffic Apprentice can check this page for the complete details. 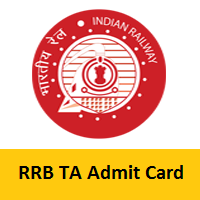 You can also download the RRB TA Hall Ticket 2019. Refer the later sections of our page for further details about the examination such as exam date, the information available on the admit card, steps to download the hall ticket, important documents to be carried. You can also visit the official website indianrailways.gov.in for complete information. The Railway Recruitment Board is conducting the examination for the post of Traffic Apprentice. There are totally 1645 posts across India. This is a good opportunity for the aspirants who are preparing for railway jobs. Candidates applied for the post will their valid admit cards soon. The examination date and the release date of the admit card are not yet announced. Soon after the announcement of the examination date and release date of the admit cards by the RRB officials, we will update them in our posts. Also, you can find the selection process of the RRB TA Examination. The selection process is very simple. firstly, candidates applied for the examination need to attend a written tets. If you get qualified in the written test, then you will be promoted to the next round, which is the document verification round. Signature of candidate and exam counselor. Firstly, enter into the Railway Recruitment Board official website (indianrailways.gov.in). You will get the home page of the official site on the screen. Then, scroll down the home page. You will find the flashing link for the RRB TA Hall Ticket. By giving a click on that link, you will get a form to be filled. Before submitting the form check it once again. After making sure that the details given are accurate, then click on the submit button. Your details will be saved and Admit card will be generated. Download the admit card and take 2 or more copies of the admit card. All the best for the candidates appearing for the RRB Traffic Apprentice Examination. We hope that the information mentioned above is useful for your reference. For any queries, you can contact us at freshersnow.com.